Nutrient pollution from outdated sewage-treatment plants degrades water quality in the world’s deepest, oldest lake. Siberia’s Lake Baikal is the world’s largest lake by volume, containing nearly 20 percent of the planet’s fresh surface water. The ancient lake harbors an astounding array of biodiversity and is so treasured in Russia that it has its own anthem. Excessive nutrients, most likely from outdated sewage-treatment facilities in coastal cities, are now spoiling the waters of Baikal with waves of an alga called Spirogyra. During the fall of 2013, researchers found blooms of the algae along the northwest coast of the lake, near the town of Severobaikalsk and the estuary of the Tyya River. The lake is also at risk from rising temperatures due to climate change, and a mysterious illness caused a massive die-off among the lake’s unique sponges over the past two years. The graphic below depicts the Lake Baikal watershed, which stretches south from Russia into Mongolia, and notes potential threats to the lake’s health. Lake Baikal, the world’s largest lake by volume, is suffering algae blooms due to nutrient pollution. Click image to enlarge. This graphic is the second in a five-week series documenting threats to the world’s largest lakes. The first graphic detailed declining water levels in Lake Urmia. 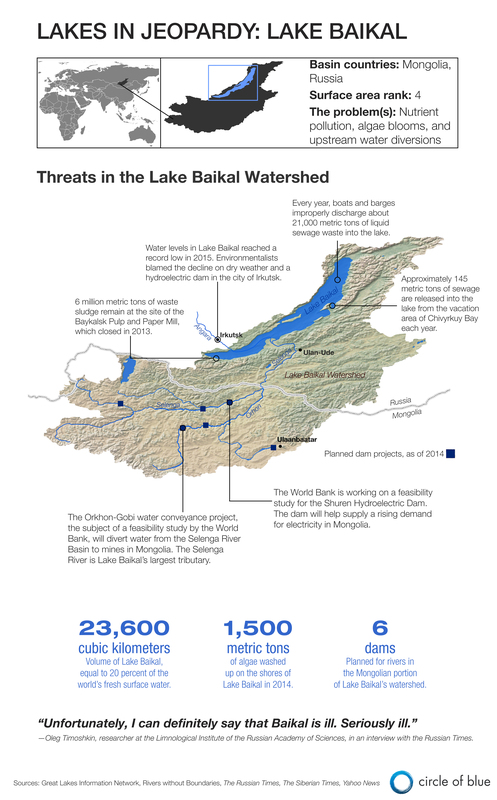 Click here to read Circle of Blue’s report about Lake Baikal and other endangered lakes and here to view an interactive map of threats to the 20 largest lakes in the world. Crystal Edmunds and Codi Yeager-Cozacek contributed to this infographic. Reach Crystal Edmunds at ce301005@ohio.edu and contact Codi Yeager; or tweet to @ce301005 and @codicozacek.